Plot Synopsis: After he is fired from the Anti-Villain League for failing to take down Balthazar Bratt (TREY PARKER), the latest bad guy to threaten humanity, Gru (STEVE CARELL) finds himself in the midst of a major identity crisis. 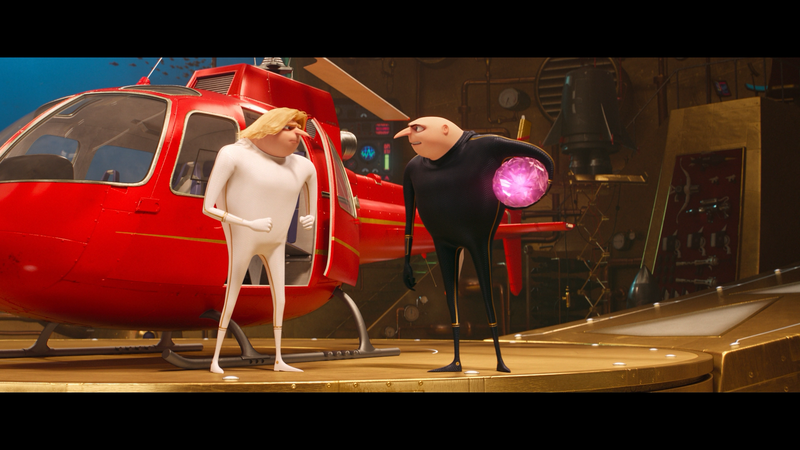 But when a mysterious stranger shows up to inform Gru that he has a long-lost twin brother – a brother who desperately wishes to follow in his twin’s despicable footsteps – one former super-villain will rediscover just how good it feels to be bad. Quick Hit Review: I’ve found the Despicable Me franchise to probably be a step ahead of the first few Ice Age films, Minions was a misfire however, and with this third entry, it solidified itself in the good but not great category. 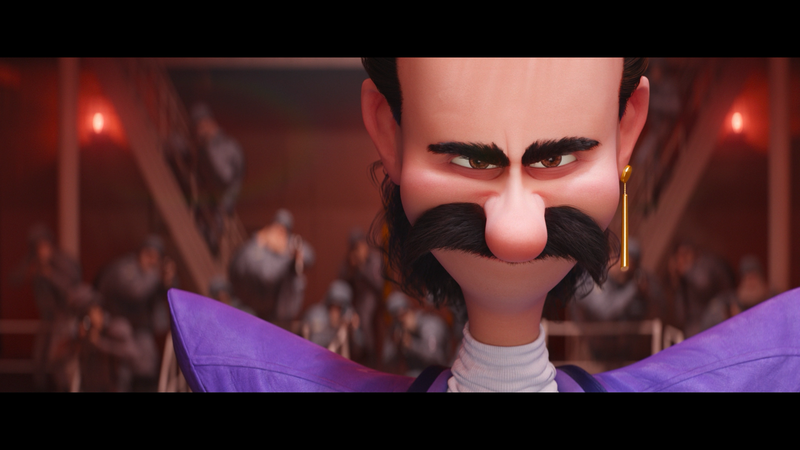 The Gru character isn’t anything special though having the likes of Steve Carell voicing does help making him fun but where Despicable Me 3 excels is with the introduction of the newest villain, Balthazar Bratt, a 1980s child star grasping tight to the era, including some great music, and holding a grudge for his show being cancelled when he became a zit-faced teenager. It’s the Bratt villain that helps out from what was an otherwise lackluster, even jumbled, sequel that has more amusing scenes and set-ups than anything that made me laugh-out-loud, though outside of a crude scene or two, is perfectly fine for families. The story is on the basic side although they do add a wrinkle giving Gru a twin brother, Dru which in itself does set up for a potential fourth movie which is probably a given with this raking in over $1 billion worldwide against an $80 million budget. While I did like the first movie and even these now two sequels, not sure how much replay value Despicable Me 3 has as I find Gru to be rather one-dimensional saved only because of Carell’s voice work. The others such as Kristen Wiig and Steven Coogan are more or less underutilized which makes sense since the central focus is on the twin brother relationship and stopping Bratt. This release comes with a matted and embossed slip cover. Inside is a redemption code for the Digital HD copy. Deleted Scene (0:40; HD) – This involves Edith pulling a prank. 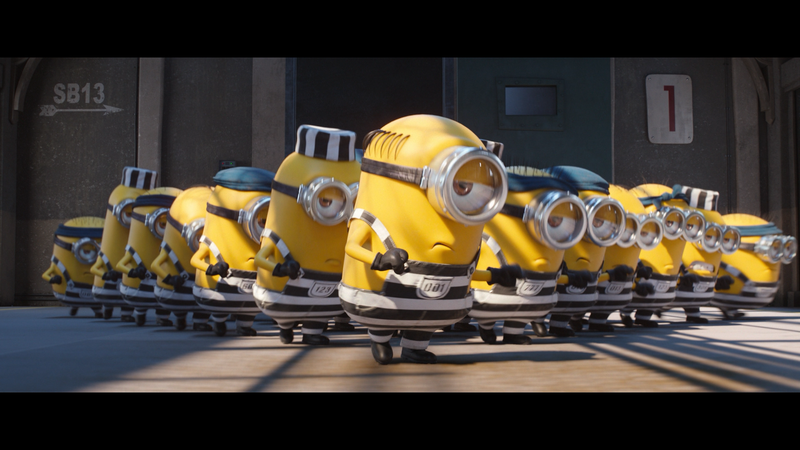 Minion Moments (TRT 1:18; HD) are two mini-shorts involving the lovable yellow lumps. 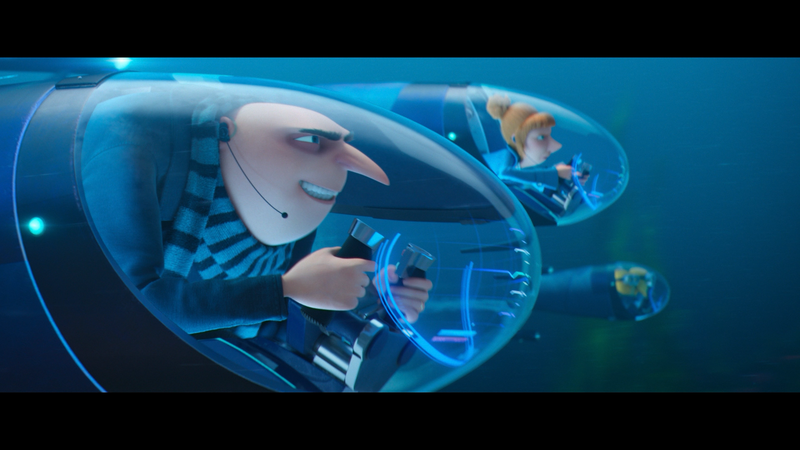 The Making of Despicable Me 3 (6:50; HD) takes viewers behind the scenes on the process of coming up with the story for this third movie. Developing Dru (4:13; HD) is on the creation of the twin brother and distinguishing him from Gru. Also included are AVL Files and Freedonia Visitors Guide, both interactive features; Despicable Me TV which are fake adverts; “Doowit” Sing-Along (1:36; HD); “Yellow Light” Music Video (3:43; HD) by Pharrell Williams; Minion Mugshots and Wanted Posters image galleries. 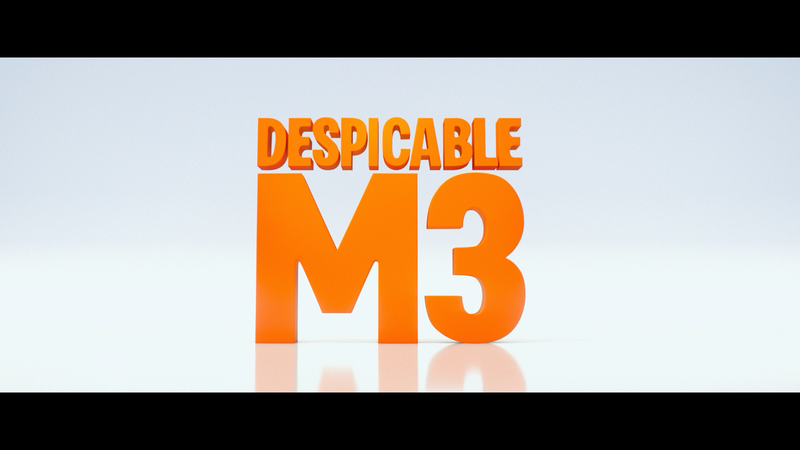 Despicable Me 3 plots itself onto the 4K UHD format presented with a 2.40 widescreen aspect ratio and a 2160p high-definition transfer (HEVC/H.265). 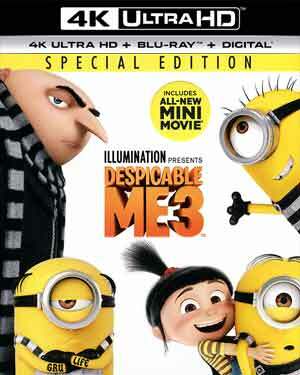 As one would imagine, these 3D CGI animated movies tend to benefit on Blu-ray or 4K and this is no different; colors are absolutely bright with excellent pops such as the yellows on the Minions, detail is sharp and nicely defined and there’s nary a sign of artifacts, aliasing or other flaws – and this goes for the Blu-ray as well. While that does not have the benefit of HDR10, there are still strong colors present. Both the 4K and Blu-ray discs come with DTS:X tracks and although I generally never get the full appreciation compared to that of their live action counterparts, this still sounds excellent. Dialogue levels come through primarily the center channel with great clarity while the bodacious 1980s soundtrack, mixed in with the score, does provide some good depth through the front and rear channels while the LFE does kick in for an extra boost. Overall, Despicable Me 3 is a perfectly ‘fine’ CGI animated movie, though there’s nothing here that particularly stands out, but thanks to the Minions storyline and the scenes with Balthazar Bratt, I did manage to chuckle a few times. Not sure if this was necessary, of course, but since it took in so much at the worldwide box office, can’t think it’ll stop here. The 4K/Blu-ray combo pack offers excellent video and audio transfers however the features are a bit bland.